Willard was a surprise hit when it opened in 1971, earning $14.5 million. That was a tidy sum back then. Without a doubt, the highly unusual story was a big draw. It's hard to think of anything else quite like it at the time. But the movie is also well-done and entertaining, which certainly solidified its success. 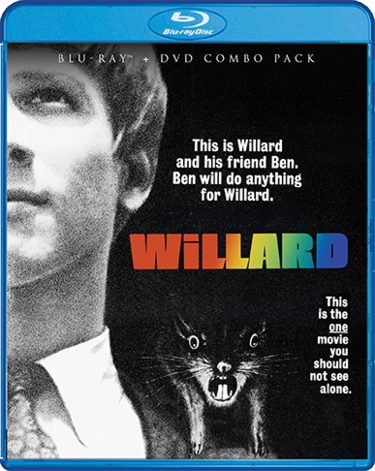 Scream Factory brings Willard and its sequel Ben (reviewed here) to DVD/Blu-ray combo pack on May 16. This is a double feature deserving of attention. Bruce Davison plays Willard Stiles, a nerdy, socially awkward young man who lives with his overbearing mother (Elsa Lanchester). He is repeatedly harassed at work by his boss, Al Martin (Ernest Borgnine), a cruel womanizer who clearly enjoys making life miserable for his timid employee. One day, Willard discovers some rats living in his backyard. Rather than kill them, he trains the critters, taking a particular liking to their seeming leader, whom he names Ben. Pretty soon, more rats begin showing up. Willard trains them all, and when Martin pushes him to his breaking point, he commands his furry friends to exact revenge. Besides, who doesn't love a good underdog story? Willard shows the character gradually finding his inner strength thanks to his rodent pals. There's a magnificently icky scene where he unleashes them upon Martin's fancy dinner party, and the final showdown between the men is a little masterpiece of rat-related mayhem. Director Daniel Mann stages everything in a way that maximizes its skin-crawling appeal. Willard is a welcome arrival on Blu-ray. It's one of those movies that every horror buff needs to see. Scream Factory's DVD/Blu-ray combo pack comes with some good supplementary material. There's a ten-minute interview with Bruce Davison, who talks about how he was cast in the role, working with Ernest Borgnine, and being covered with hundreds of rats for the finale. When talking about his human co-stars, he has a tendency to imitate them, which is very funny. Clearly, working on the film was a valuable experience for the actor. The theatrical trailer and some TV spots are also here, as is a very cool vintage radio ad. The marketing is represented via a still gallery that contains behind-the-scenes shots, poster images, and more. Picture and sound quality are surprisingly good, considering the film's age. Willard is rated PG for rat-related violence. The running time is 1 hour and 35 minutes.